'Money Heist': Will they Hold Up the Bank of Spain in Season 3? The shooting location of the third season of 'Money Heist' is of utmost secrecy. Nothing less that the most precious care is being taken with Netflix's most successful non-English speaking series. Officially, all we know is that the majority of the main cast will be returning (including Pedro Alonso, somehow, despite his apparent death in Berlin). We have also been told that joining the familiar faces will be Najwa Nimri, Hovik Keuchkerian, Fernando Cayo, and Rodrigo de la Serna, and that, in the words of Netlflix, "this time it will be more than a robbery". But what could be the next step for the gang and its leader, The Professor? According to eCartelera.com, who have had access to sources close to production, the robbery this season will be nothing less that the Bank of Spain in the centre of Madrid. It would make sense that, after the The Royal Mint of Spain, that Tokio and the others would set their sights on something even bigger. But as well as this, another interesting suggestion about the obstacles these thieves will face when carrying out their mission. Netflix has refused to comment, but according to rumours from said source, all will play out in the heavily guarded chamber of gold ingots which lies beneath Madrid's Plaza de Cibeles. The infrastructure for the chamber was built before the Civil War and is found 48 metres deep with a surface area of 2.5km squared. The chamber has extreme flooding security, meaning that it in case of a break-in it would fill with water and automatically shut, locking the thief inside. Furthermore, the doors would rust when in contact with water, making it even more difficult to open them. It was a method invented almost a century ago with the Professor's level of ingenuity. Will they come out with the loot this time? This impressive security system is based in the the real chamber underneath the square. The water flows from the Pascualas streams, which run almost just beneath the surface of the main roads surrounding the square, Plaza de Cibeles, and provide the water for the fountain in its centre. It was made clear at the start of January that the plot will take place somewhere near the centre of Madrid, when the square, Plaza de Callao, was filled with fake notes during the filming, surprising all the passers-by. Might this have been the season finale? As of yet we do not know the release date. 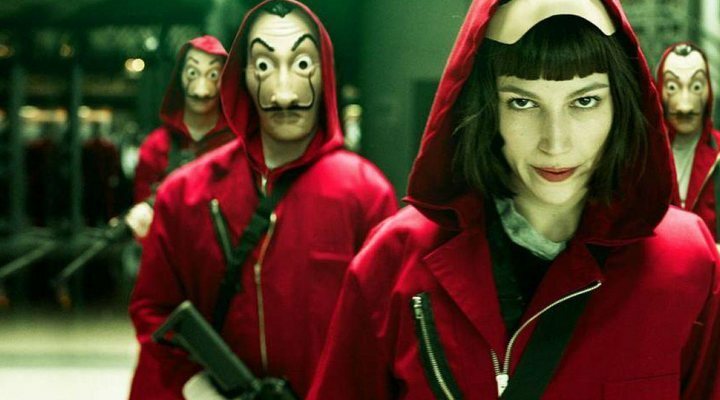 The third season of 'Money Heist' will be streamed on Netflix at some point this year. The platform announced filming at the start of October, with a video in which we see the faces of the cast: Úrsula Corberó (Tokio), Álvaro Morte (the Professor), Jaime Lorente (Denver), Miguel Herrán (Río), Darko Peric (Helsinki), Alba Flores (Nairobi), Esther Acebo (Estocolmo), Itziar Ituño (Raquel Murillo), Enrique Arce (Arturo), Kiti Mánver (Mariví), Juan Fernández (Coronel Prieto) and Mario de la Rosa (Suarez), along with the creator, Álex Pina, and director, Jesús Colmenar. Lastly, we also know that the knew characters are named Bogotá (Keuchkerian), Alicia (Nimri) and Tamayo (Cayo). And that is all we can say for now.